One of the vital links in the image processing chain is of course the monitor, upon which our view of the process totally depends. 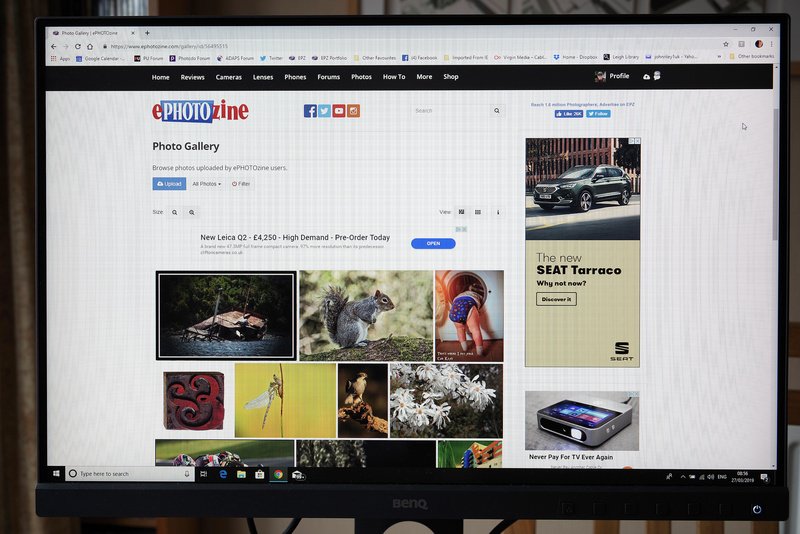 Intended specifically for imaging, be it photography or graphics, this IPS monitor, with its wide colour gamut (100% sRGB, 99% Adobe RGB) and wide (178 degree) viewing angle seems to be one of the prime choices. Let's live with the BenQ 24” version for a while and see if it fulfils all the criteria that critical imaging requires. 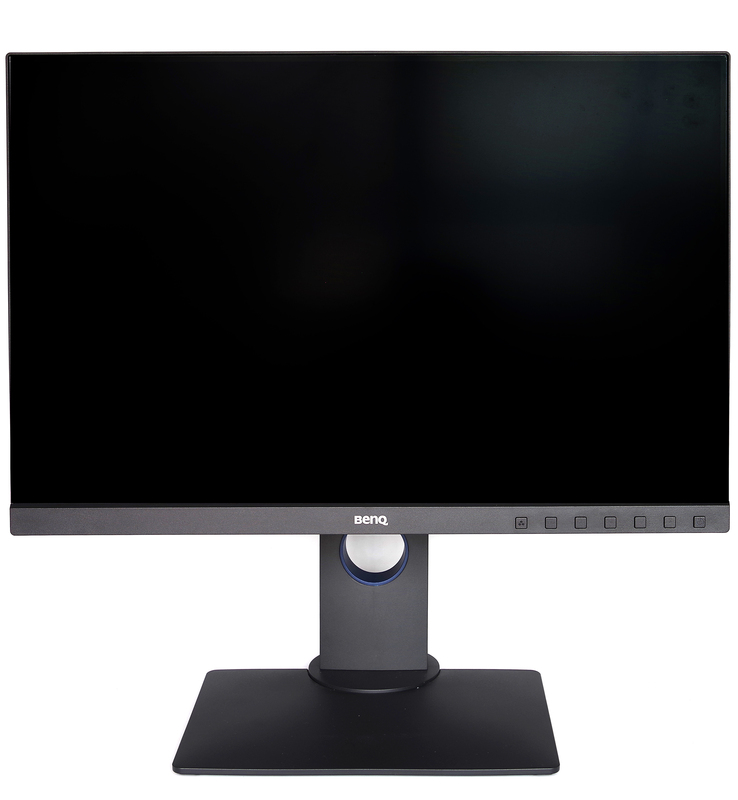 The BenQ SW240 is a 24.1” IPS monitor offering a wide gamut of 99% AdobeRGB and 100% sRGB. The IPS technology means that there is a very wide 178 degree angle of view, so positioning of the viewer is not as critical as it is with some other technologies. It is especially superior to the average laptop screen, where the slightest change of viewing position can radically alter the image. The display offers a 1920x1200 HD resolution with 1.07 billion colours. LED backlight technology gives a maximum brightness of 250 cd/m2 with a pixel pitch of 0.27mm. Native contrast is 1000:1, the refresh rate is 60HZ and the response time is a creditably fast 5ms (GtoG). 10 bits colour enables added smoothness that will be appreciated for video and gaming use. The screen aspect ratio is 16:10. 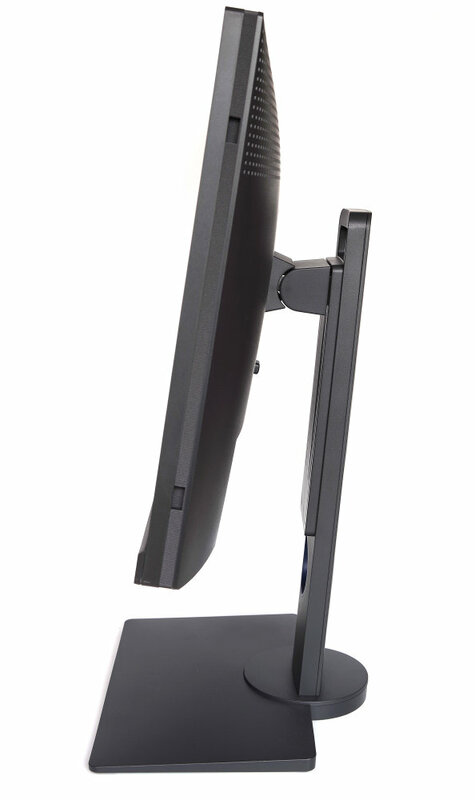 The monitor can be wall mounted and is also supplied with a stand that enables rotation to portrait format if required. If moving the monitor to that orientation the security of the power cable should be noted as it fits positively but can still be slightly dislodged unless care is taken. The professional features include 14 bit LUT (Look up tables), a deltaE value of<=2 (average), hardware calibration, a black and white mode and a Factory Calibration Report. This is clearly a monitor aimed squarely at photographers and a hotkey provides quick switching between AdobeRGB, sRGB and black and white modes. An SD card reader is also included, supporting SD, SDHC, SDXC and MMC cards. 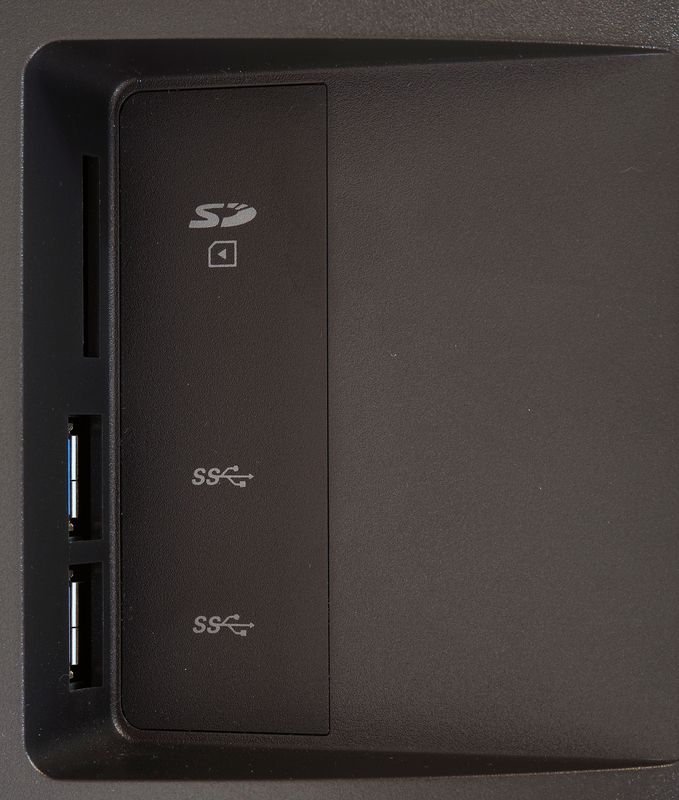 Other connectivity is provided by 1 DVI-DL, 1 HDMI (v1.4), 1 DisplayPort (v1.2), 2 USB 3 Downstream and 1 USB 3 Upstream connections. The net weight is a reasonable 6.7kg, not including the optional hood. The swivel available on the desk mount is 45 degrees left/right and -5 to +20 degrees tilt. There is also 140mm height adjustment. This all gives plenty of opportunity to settle the monitor into the desired position. Software is provided for calibration in the form of BenQ's Palette master Element. Supported calibration devices are the X-Rite i1 Display pro/iPro/iPro 2/iPro Studio and Datacolor Spyder 4/5. The monitor is boxed well and should be fine in transit. A good selection of cables is provided, with the exception of a USB-C connector that could be essential for Mac users. Otherwise, everything is well catered for and the monitor can be set up quickly and effectively straight from the box. The calibration report gives assurance that performance should be close to optimal, and indeed that is the case. It would be possible to use the monitor without any further calibration whatsoever and still obtain good results. The display is almost edge-to-edge and the monitor itself is totally unobtrusive. The only exception could be the white on/off light, but it is not so bright as to be a distraction. Users with operating systems from Windows 7 onwards will find the monitor is compatible, older analogue display cards could be a problem and in that case a computer upgrade may well be needed. In use, the monitor was used at a fairly bright level of ambient lighting, that being preferred by those using it, and it was found to be very good in terms of potential eye fatigue. Older, brighter screens can be quite tiring on the eyes but a good IPS display can be a revelation. BenQ have taken this aspect particularly seriously, including eye experts in their development team. In any event, advice is also offered regarding how much rest from the monitor screen is considered essential for good eye health care. 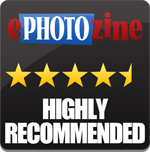 Good, crisp images with relaxed intensity that enables long working sessions without fatigue. Accurate colour and contrast. All of this can be achieved straight out of the box, but further enhancement can be made by using the calibration software along with a suitable device. The fast refresh rate and response time ensure that video is flicker free and smooth. No doubt the gaming experience would also be good, but that is probably not the main purpose of this monitor. 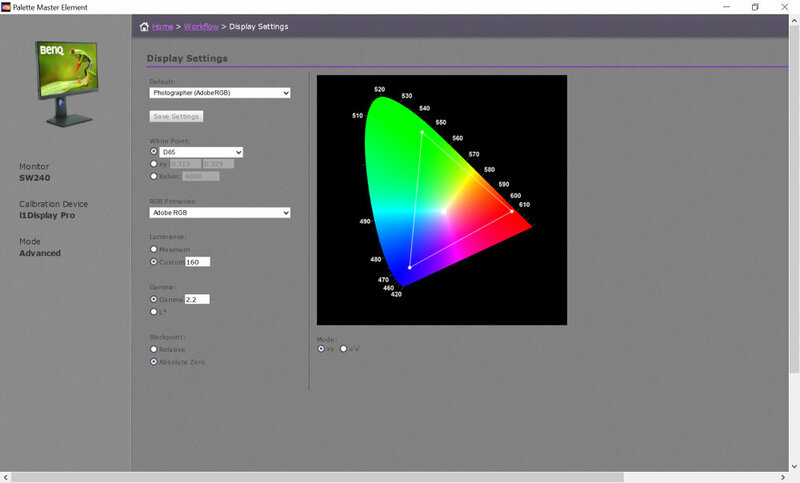 Using BenQ's Palette Master element software set to Calibration 1, 160 cd/m2 and 6500K colour temperature, the results were obtained using the X-Rite i1 Display Pro calibration device. Colour temperature was almost spot on at 6515K and the brightness was also very close, as we can see from the screen grabs, but there was a bit of a drift across the field. However, to be fair, this is not really apparent to the human eye and is really quite an impressive result. 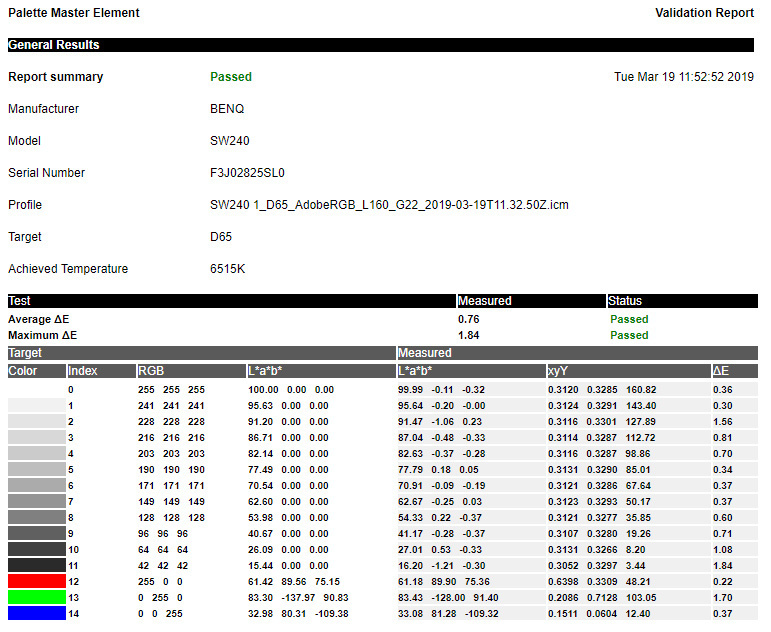 The Validation report was very interesting and showed that the delta E values were also impressive. The target value for this monitor is <=2 and in fact this is comfortably exceeded. The lower the value the better as we are measuring here the deviation between the expected colour and the actual colour as measured. This result can be saved as an HTML document and kept of file so that the performance of the monitor can be maintained with periodic checks. 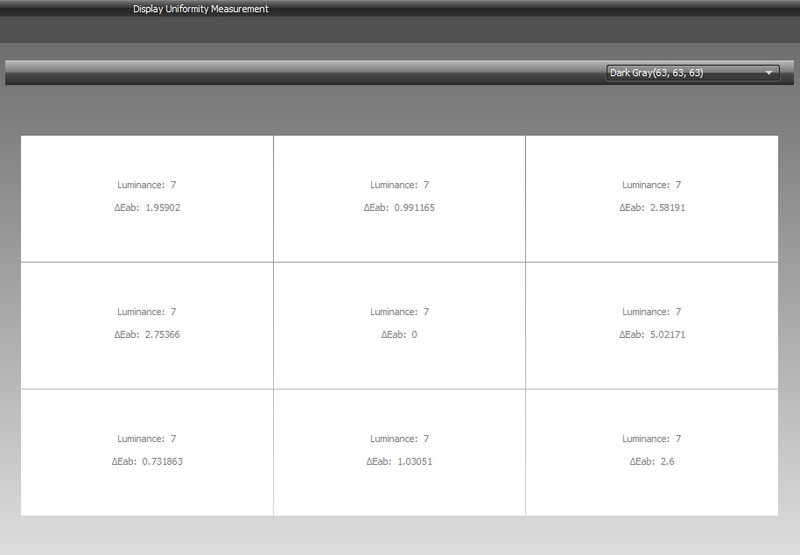 Looking at consistency across the screen, the white point value was 164 (160 set) at the centre, almost exactly right. The peripheral field did darken slightly, but only down to about 153-158, which is very close to the centre value and to the aim point. The grey point values were even closer, 35 at the centre, with peripheral variation from 32-34. This is so even as to make no practical difference. The dark grey point values were identical at 7 across the entire field, in other words totally without luminance deviation. 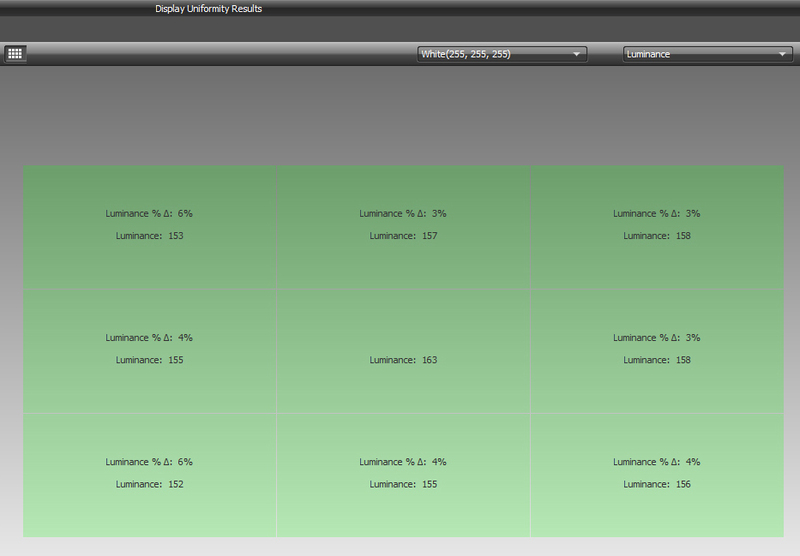 Looking at all the DeltaE values, the majority of these are all well under the value of 2, indicating that colour accuracy across the screen is very accurate. The BenQ SW240 looks excellent value for money. It is essential that a monitor can be lived with on a day to day basis and the BenQ certainly offers a relaxed (from the eyes' point of view) and accurate performance in every respect. Perhaps the ability to move the screen to a portrait orientation is a bit superfluous and awkward, but ergonomically everything else is fine. The monitor also looks good, not essential in terms of function but it is undeniably an added pleasure to own a good looking bit of kit. The BenQ SW240 monitor is excellent, the price is excellent and the BenQ offers a highly viable upgrade path that should be highly successful. The BenQ SW240 is an excellent IPS monitor, especially for photography and graphics, at a very fair price.